He began playing organized baseball at 11, playing catcher and third base. During a tryout with the Pirates at age 16, a 95mph fastball hit him on the head when he was standing on the plate. It busted his helmet and knocked him unconscious. At practice the next day he found he no longer could hit because he had become afraid of the ball. So he switched to pitching (Reyes no longer has a fear at the plate)...Has a smiley face tattoo on his elbow where he has a scar from Tommy John surgery...Nickname is "El Tibu," which is short for Tiburon, meaning Shark. 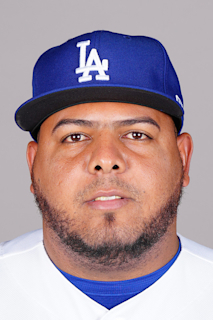 Made an Opening Day roster for the first time in his career...was originally optioned to triple-A on March 12, but was later added back to the roster for the Bay Bridge Series against the A's at the end of spring due to SF's injuries...Went 5-2 with a 2.49 ERA (18er, 65.0ip) in 69 games for the Giants...His 69 appearances ranked as the second-most by a Giants rookie pitcher in SF-era history (Elias Sosa, 1973, 71 gms)...Limited opponents to .154 avg. against, the third-lowest figure among NL relievers (Hader, .132, Doolittle, .135)...His 41 inherited runners led SF and ranked as the eighth-most in the NL...allowed just nine of his last 41 IR to score (22%), the seventh-lowest figure in the National League...Set the Giants record for fewest hits per 9.0 innings (4.71), with a minimum of 50.0ip...prior to Moronta, Steve Reed had the fewest hits allowed per 9.0 innings in 1998 (4.90) (Baseball Info Solutions)...First batters faced were just 2-for-55 (.036) off him... however, allowed 13 walks to his first batters faced...Opponents were 0-for-10 off him with the bases loaded. Split his seventh professional campaign between double-A Richmond and triple-A Sacramento and was also a Sept. call-up for San Francisco...Was recalled from triple-A Sacramento Sept. 5 and allowed two runs in 6.2 innings, covering seven games...Was recalled twice...was on SF's roster on May 10, but did not appear in the game...Made his Major League debut on Sept. 5 at Colorado and allowed one run in 0.2 of an inning...Struck out 11 batters in 6.2 innings of work (14.85 strikeouts per 9.0 innings)...Appeared in 19 games with double-A Richmond, posting a 4.00 ERA with five saves...Made 13 appearances with triple-A Sacramento, posting a 3-0 record with a 2.12 ERA (4er, 17.0ip). Was named to the mid-season California League All-Star team...led the league in appearances and finished tied for third with 14 saves. Recorded 13 out of his 14 saves in the second half of the season. Struck out 93 batters over 59.0 innings, putting up a 2.59 ERA and notching 14 saves in 18 chances. Was added to the Giants' 40-man roster over the winter. Spent the entire season pitching out of the Augusta (A) bullpen...led the GreenJackets with 12 saves and was 1-7 with a 5.73 ERA in 42 relief appearances. Led the the AZL Giants (Rookie) with five saves...struck out 30 batters over 19.1 innings. Worked as a starting pitcher for Salem-Keizer (short-season). March 29, 2018 San Francisco Giants recalled RHP Reyes Moronta from Sacramento River Cats. March 13, 2018 San Francisco Giants optioned RHP Reyes Moronta to Sacramento River Cats. September 5, 2017 San Francisco Giants recalled Reyes Moronta from Sacramento River Cats. July 25, 2017 RHP Reyes Moronta assigned to Sacramento River Cats from Richmond Flying Squirrels. July 16, 2017 Richmond Flying Squirrels sent RHP Reyes Moronta on a rehab assignment to AZL Giants. June 3, 2017 Richmond Flying Squirrels placed RHP Reyes Moronta on the 7-day disabled list. May 11, 2017 San Francisco Giants optioned RHP Reyes Moronta to Richmond Flying Squirrels. May 10, 2017 San Francisco Giants recalled Reyes Moronta from Richmond Flying Squirrels. April 2, 2017 RHP Reyes Moronta assigned to Richmond Flying Squirrels from Sacramento River Cats. March 14, 2017 San Francisco Giants optioned RHP Reyes Moronta to Sacramento River Cats. November 18, 2016 San Francisco Giants selected the contract of Reyes Moronta from San Jose Giants. April 1, 2016 RHP Reyes Moronta assigned to San Jose Giants from Augusta GreenJackets. December 21, 2015 RHP Reyes Moronta assigned to Leones del Escogido. August 13, 2015 Augusta GreenJackets activated RHP Reyes Moronta from the 7-day disabled list. July 27, 2015 Augusta GreenJackets placed RHP Reyes Moronta on the 7-day disabled list. April 9, 2015 RHP Reyes Moronta assigned to Augusta GreenJackets from AZL Giants. March 20, 2015 RHP Reyes Moronta assigned to San Francisco Giants. June 22, 2014 RHP Reyes Moronta assigned to AZL Giants. September 18, 2013 Salem-Keizer Volcanoes activated RHP Reyes Moronta from the 60-day disabled list. July 29, 2013 Salem-Keizer Volcanoes transferred RHP Reyes Moronta from the 7-day disabled list to the 60-day disabled list. July 15, 2013 Reyes Moronta assigned to AZL Giants from Salem-Keizer Volcanoes. July 14, 2013 Salem-Keizer Volcanoes placed RHP Reyes Moronta on the 7-day disabled list. June 14, 2013 RHP Reyes Moronta assigned to Salem-Keizer Volcanoes from AZL Giants. May 28, 2012 Reyes Moronta assigned to AZL Giants from DSL Giants. June 2, 2011 Reyes Moronta assigned to DSL Giants.